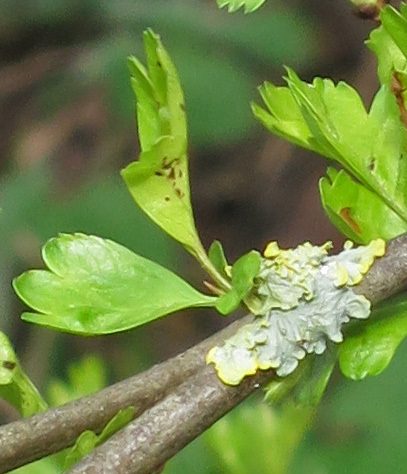 LOOSE AND LEAFY in DORSET: NEW APPROACH? and tiny flecks of lichen. I've been having a bit of a crisis. Here am I with two blogs and hardly any posting. Have I lost interest? NO! Am I ailing? NO! People expect different things from blogs. I don't know what each reader expects when they arrive at Loose and Leafy but it's not a scrap book. There's a point to every post. Which is the rub. I've been out and about and looking at things almost as much as usual but the light has been so low and so many of the days rainy, photographing has been more of a challenge than fun. But for all that Loose and Leafy is a blog anyone can read, it's also my own record, a kind of index to what I've seen. So if I don't post, I'm missing out. I'll lose my personal thread. SO . . . I'm going to be selfish. There will probably ensue a fleet of random posts. Maybe some will be nothing more than a picture. Bits and bobs are better than silence. Hopefully, this won't be too irritating. If it is . . . you can always give Loose and Leafy a miss for a while and come back when the text is better. On the other hand, you can hang around and, with me, say 'Oh look! There's a duck!'. When the hedges are dripping and waiting for warmth, one potters off elsewhere - like the seashore. There have been storms at sea. At one point the cross channel ferry service had to be suspended because waves were too high for the boats to cope. 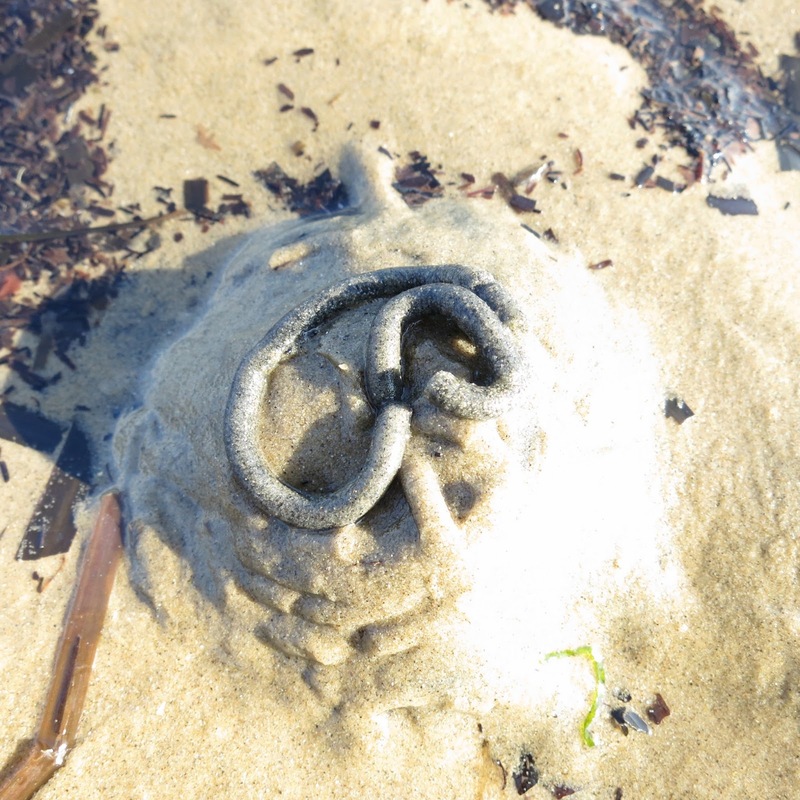 And on shore - huge deposits of seaweed that must have been churned up have been chucked over the sand. 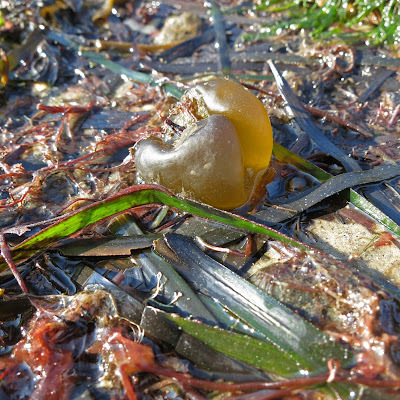 Here's an Oyster Thief (Colpomenia peregrina) - a green alga that looks like a bubble. Well, it is a bubble. That's how it gets its name. If it mistakes an oyster for a rock and sticks to it, the air inside can lift them both and they can float away together. Worm cast at the rear end of a Blow Lug hole. About two inches across and high. Another day . . . head for a fresh-water lake . . . and a famous bird. This individual, I mean. Not its kind in general. It's a Hooded Merganser (Lophodytes cucullatus). When I took the photograph, I didn't know there was anything special about it. I just thought 'Oh, there's a nice duck, I'll take a picture of that.'. Later, I found out it's a North American bird that has been hanging out with tufted duck on Radipole Lake (part of an RSPB reserve) for a few years now. When it first arrived, bird watchers got very excited, thinking it was truly wild and had flown (or floated?) across the Atlantic. It's now thought to be an escapee from a collection. I get the impression that this, for bird people, is a bit of an anti-climax. According to the train spotting approach to bird watching (see-it-and-tick-it) it doesn't 'count'. But I reckon it's still a pretty duck, wherever it came from. This is a misleading picture. The coot's feet were much whiter than they seem here. Sometimes, as I've said often before, there's an enormous advantage in not knowing things because whatever you come across is exciting and new. 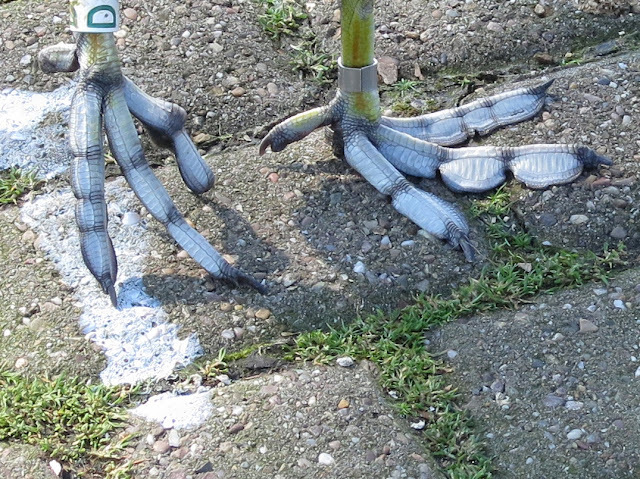 You may remember how bowled over I was when I first noticed Coots' feet. (Coot - Fulica atra.) Apart from their extraordinary shape, I was stunned by their blueness. Yesterday, I was stunned by their whiteness. The blue tint shows more in this picture than seemed to be there in real life. It was the palor which struck me. That and that it was happily slurping up white bird excrement. (I didn't stay to find out whether this was its own or somebody else's - I'd noticed the merganser by then.) So - next task - which you might help me with . . . do coots change the colour of their feet from blue to white in the winter? And the last of random images from my 'what I've been looking at' post . . . Wall screw-moss (Tortula muralis). Oh, dear. A scrap book post. But that's life in erratic weather. I much prefer this approach. The feet on the coot looks like AWB was fooled set it to shade and things should be fine. Hi, Adrian. You are probably right about the balance. I'm pleased you mentioned that because I was perplexed when I came home and looked at the photograph of 'white' feet. It's one of the trials of current weather. It changes between the moment one looks through the lens and pressing the shutter so the camera goes squiffy. Thanks for saying you like a more random approach. One never knows! Those feet - aren't they just amazing? I love looking at your random posts about all sorts of interesting things. Blogs should be what you want to post about and not what others expect. I just changed my header photo to say "a collection of many of things" because it used to be gardening, then crafting moved in, then all my seed info moved in, and now my enjoyment of photography seems to be taking over. 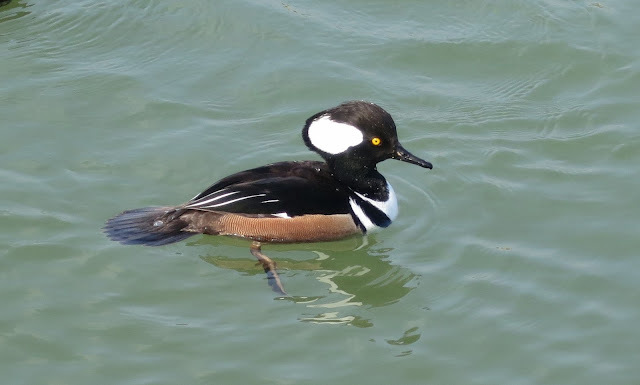 I also just captured a photo or two of a hooded merganser, but obviously not in the same location as you did. love your bits and bobs - I like tripping in on your journey - are those "rings" on the coot's feet - seem to be one on each foot - have they got gps chips in them? Your scrap-booking is fine by me. I especially enjoyed the oyster thief (first I've heard of such a thing) and the hooded merganser, a favorite. A very nteresting and varied post. never seen an Oyster Thief. Have you reported the ring number on the coot. Possibly one of Kane's from his study here in the NW. What lovely shots - looks a lot like spring. I enjoy random - that's what I've been doing too when there is so little else to talk about especially in the garden. Maybe we'll all get back on track once this awful winter ends. 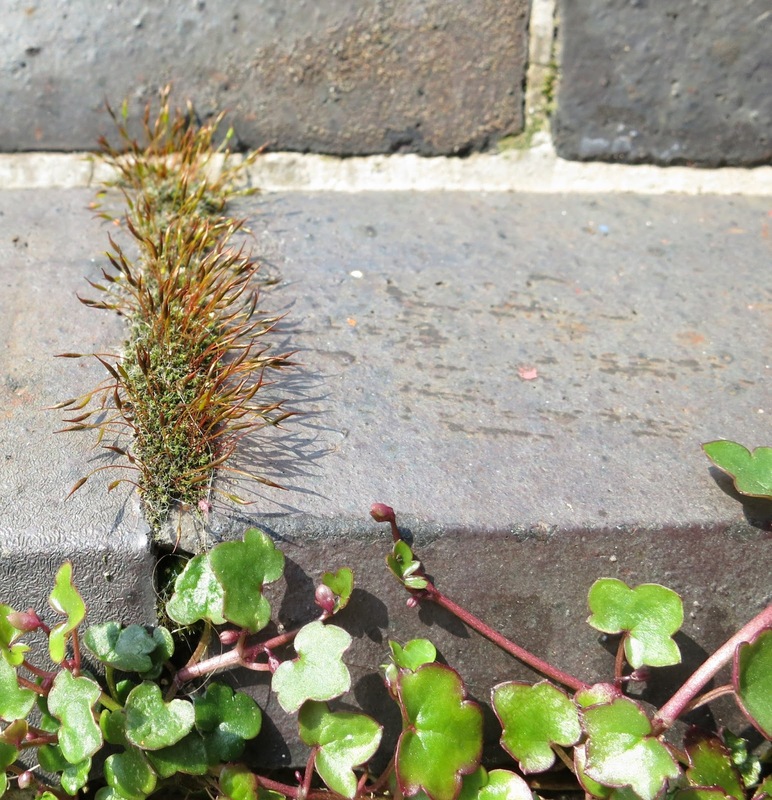 I love your random observations...that moss is spectacular! Nice scrapbook post :) It is interesting to see what the daily sights are in Dorset... and a Hooded Merganser was a surprise! We just saw a pair of common Mergansers yesterday... the first since 12 years ago. Looking forward to more observations! Seems like business as usual to me! Great stuff. My best spotting this year has been the Willets - a shore bird that is almost never in our area - I blogged about them a while back - I just happened to be at the right place at the right time - and got great photos.